Haven’t decided on a hotel yet? 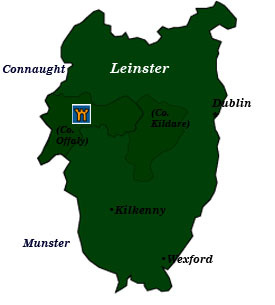 You can look at other available hotels in the Leinster region with Booking.com. Within the ancient Celtic province of Leinster, two castles—one in County Offaly and the other in County Kildare offer accommodations. Both of these counties make up what is considered the “Midlands,” a region marked by rolling hills, lakes, bogs and farmland. The counties surrounding Dublin are often overlooked while going somewhere else. However, the region is home to some of Ireland’s most sacred sites, Norman abbeys, Gothic Revival castles and the palatial houses that underscore the influence of England. You don’t have to go far to see a massive castle springing out of the countryside in this area of Ireland. The Anglo-Normans came ashore in County Wexford in 1169 and spent centuries building ever more massive fortifications to consolidate their power. Castle building came to an end with the introduction of gunpowder. Wealthy landlords began to modify the existing structures or build new, enormous residences as befit their status. Clonmacnoise monastery From the 7th to the 12th centuries, Clonmacnoise was Ireland’s most important religious complex, as well as a burial site of the high kings of Connaught and Tara. Vikings, Anglo-Normans, and the English laid waste to the site over the centuries, leaving a few towers, stone churches, and high crosses to be seen today. Castletown House (County Kildare) Now owned by the state and open to the public, Castletown House was built from 1722-32 as a private residence for William Conolly, Speaker of the Irish Parliament. The largest home ever built in this area of Ireland, its Palladian-style architecture and opulent interiors are truly magnificent. National Stud Farm and Japanese and St. Fiachra’s Gardens (County Kildare) Ireland’s thoroughbred racing traditions are evident in the grassy plains of County Kildare. Every horse lover should visit the quasi-state-run Stud Farm, where you can watch the horses exercise and learn about their breeding on a guided tour. On the same estate, the extensive gardens make a delightful interlude during a day of activities. Glendalough monastery (County Wicklow) A gorgeous setting between two lakes surrounded by forest provides a tranquil atmosphere to explore the ruins of the ancient monastic community that once rivaled Clonmacnoise in County Offaly. Russborough House (County Wicklow) For those 18th-century Anglo-Irish who could afford reckless consumption, grand Palladian-style homes were the only way to let the neighbors know you were important. At more than 700 feet , Russborough House boasts the longest frontage of any house in Ireland. The house also exhibits the Beit Art Collection (Flemish, Dutch, and Spanish Old Masters), one of the country’s finest collections. Ballyhack Castle (County Wexford) Not far from County Waterford (Munster), Ballyhack Castle is a large, 15th-century tower thought to have been built by the Knights Hospitallers of St. John, one of the great military orders of the Crusades. Kilkenny (County Kilkenny) One of Ireland’s most worthwhile destinations, Kilkenny is towered over by a terrific 900-year-old Norman castle, once the seat of the powerful Butler family, also known as the earls and dukes of Ormonde. Descendants of the family donated the castle to the state in 1967. Elsewhere in Kilkenny, the 13th-century Black Abbey features beautiful stained-glass windows, while Rothe House is a splendid example of a Tudor-era merchant’s house. Jerpoint Abbey (County Kilkenny) Considered among the finest Cistercian ruins in Ireland, building of this fortified Romanesque-style complex began in 1160. Tullynally Castle Gardens (County Westmeath) One of Ireland’s largest Gothic revival-style castles and the seat of the Parkenham family, only pre-arranged groups may visit the interior, but you are free to roam around the grounds. On occasion, musical events are held at the castle. Brú Na Bóinne (Boyne Valley) (County Meath) This extraordinary valley is the cradle of Irish civilization, giving a rare glimpse into Neolithic society. Newgrange Considered one of Europe’s most important passage graves, Newgrange dates back to 3200 B.C., making it older than even the great pyramids of Egypt. On the winter solstice, the sun’s rays travel down a 19-meter (62-foot) passage to light up the burial chamber. Knowth Archaeological excavations still continue at Europe’s greatest repository of megalithic art. Trim Castle (County Meath) This massive 12th-century castle is the largest Anglo-Norman castle in Ireland. A fun 20th-century use was as a backdrop for the film Braveheart.